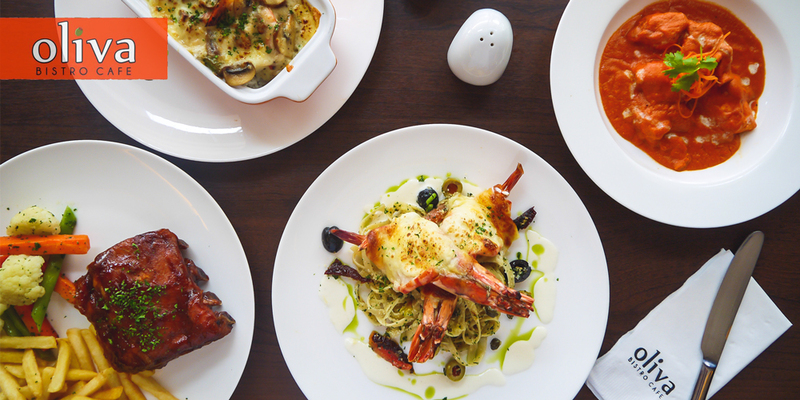 You know you’ve been enchanted when, after a lovely meal, you look at your food photos as if reliving a particularly memorable vacation. 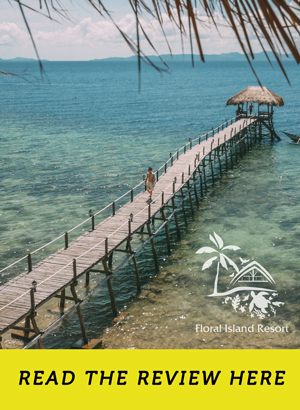 It’s like your best weekend trip: ten minutes into the drive going back home and you are already scrolling at your candid faces and captures of the beach—with a return trip already in mind. The images complete themselves without much effort, a tableau of things you look forward to. This was how it was like when I dined at Minami Saki Japanese Restaurant by Chef Kimito Katagiri. Chef Katagiri heads the kitchen—the same culinary master behind other successful hotel restaurants like Inagiku (Shangri-La) and Yanagi (Midas). 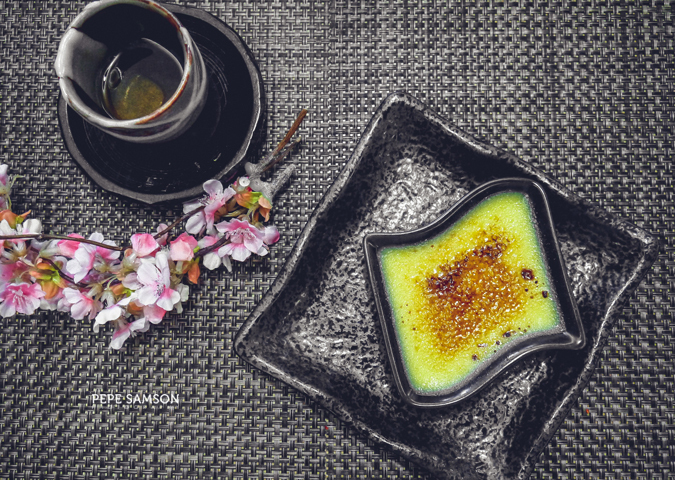 At Minami Saki, he continues to impress diners with his flawless creations, which we had the honor of trying just recently. 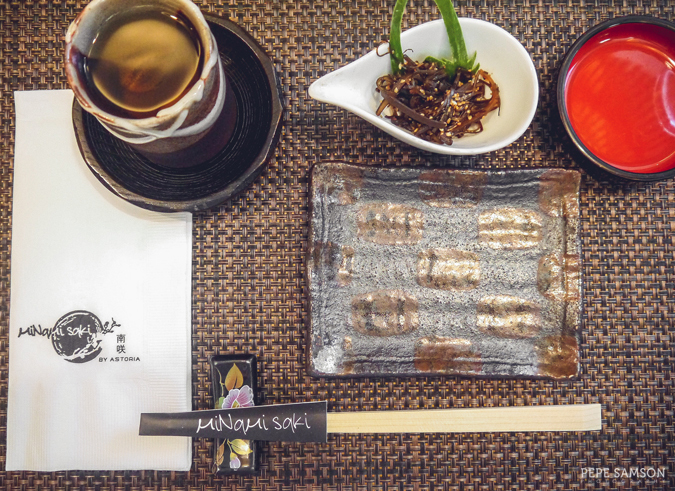 His menu constitutes both traditional and modern Japanese food, all offered in such a masterful spectacle. 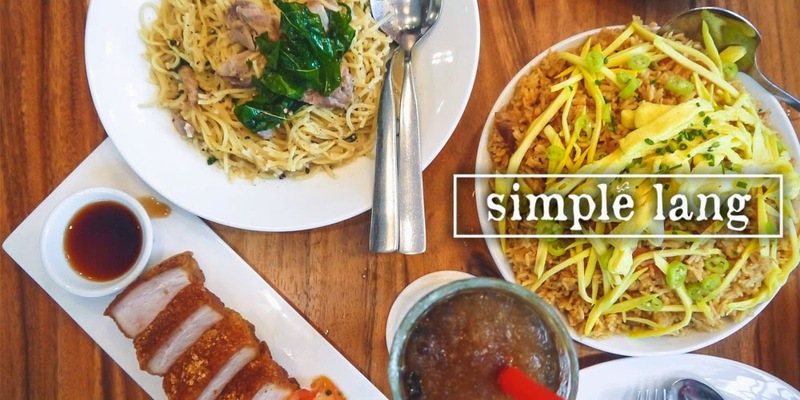 The food, vibrant and delicious, matches the restaurant’s lively sakura-inspired ambience. Cherry blossoms bedeck the small, intimate space, perking up diners almost instantaneously—just like how each piece of the chef’s sushi could. 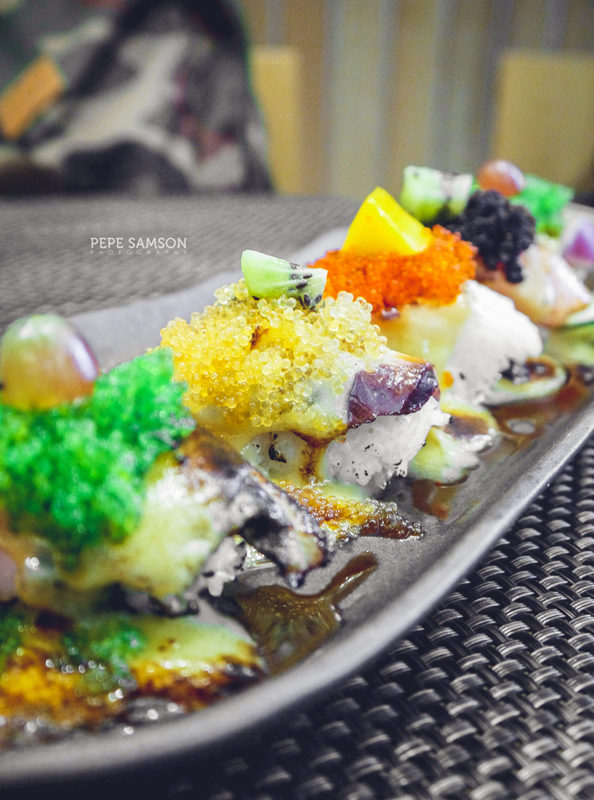 And true enough, I was enlivened by the Aburi Sushi (PhP530/3 kinds, PhP850/5 kinds)—not only by its colors but also by its flavors. You have a choice among 5 types of fish arranged and prepared impeccably—one with grape, the other with kiwi, all with fish roe on top. 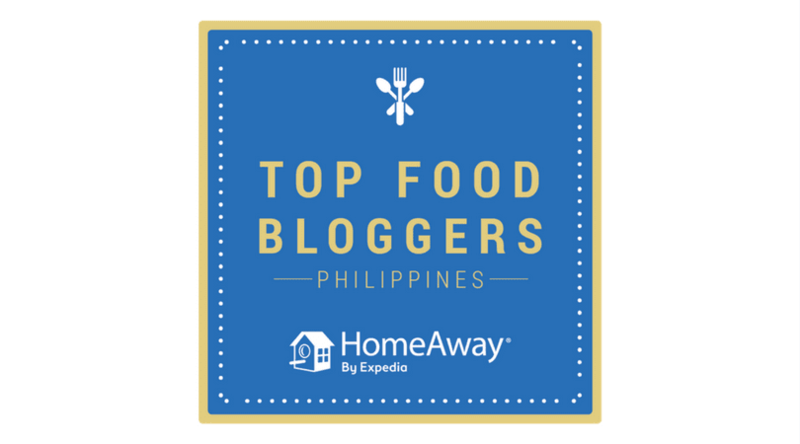 The hamachi, eel, and lapu-lapu were the strongest contenders, but I have no doubt that lovers of salmon and tuna won’t be disappointed too. 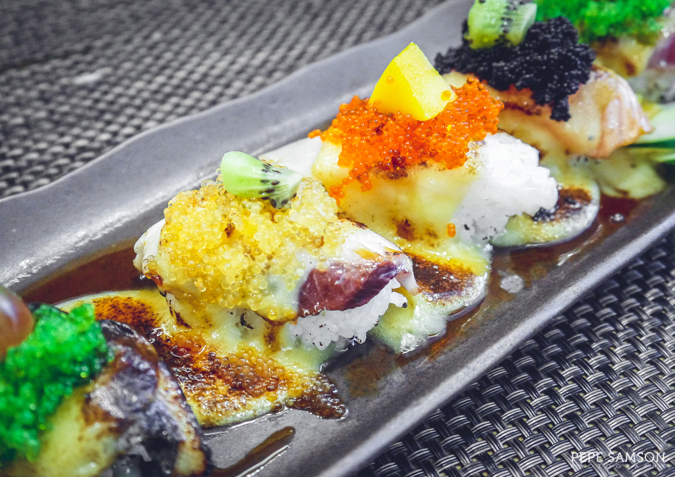 The aburi sauce, Chef Katagiri’s secret weapon, elevated the sushi to even crazier heights of deliciousness, and the light char accomplished by torching added a tasty dimension. 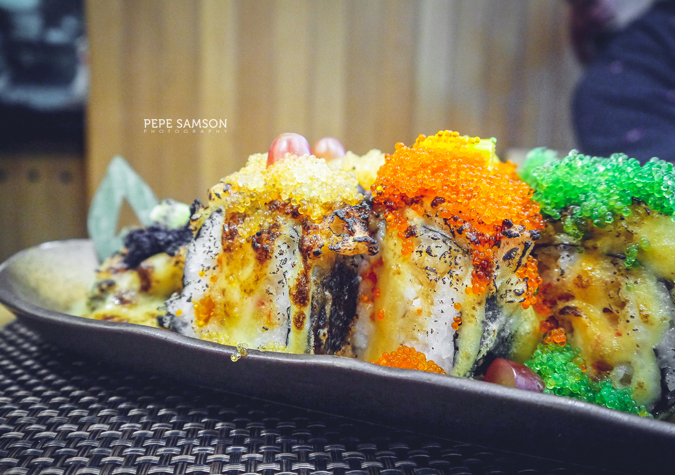 Another visual and gustatory feast is the Tempura Maki (PhP550)—resembling the aburi sushi platter a little but made with different ingredients. Plump prawns are wrapped inside Japanese rice and miso-flavored nori before being covered with tempura batter and deep-fried. The result is a lightly crispy roll that explodes with flavors. 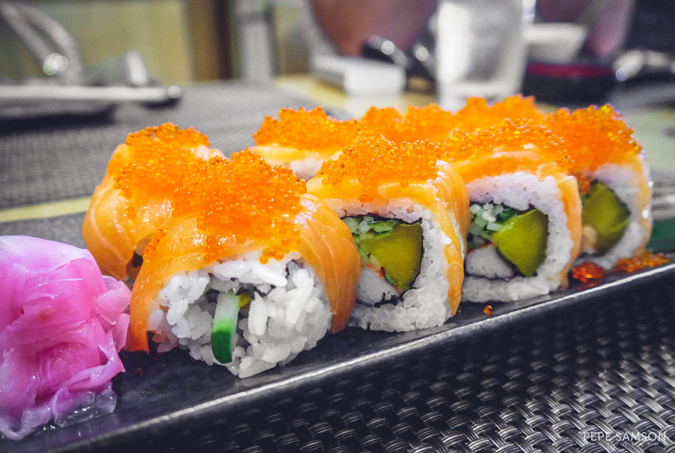 The Astoria Maki (PhP390), while more familiar, still gets a dose of the chef’s playfulness with the addition of fresh salmon and roe to good ol' California Maki. 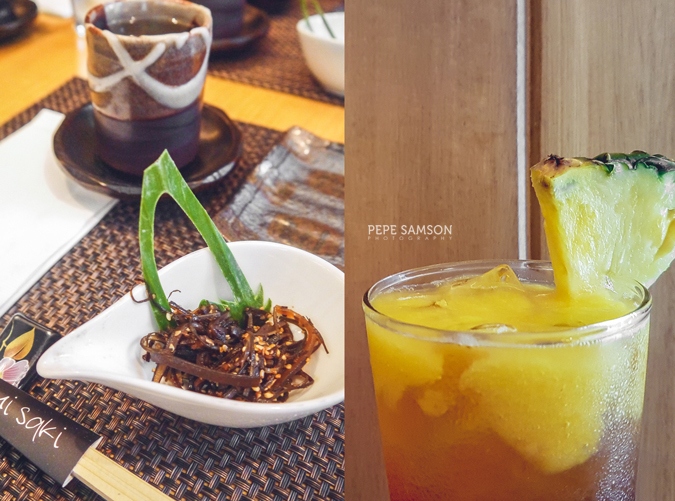 Minami Saki’s Kaki Papaya Yaki (PhP580) is unlike any Japanese dish I’ve ever had—a creation that might seem odd at first, but has the potentials of making diners behave like ravers inside a restaurant. 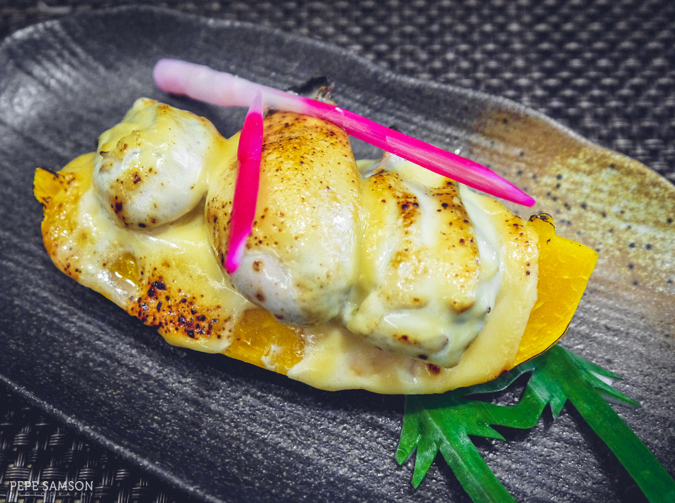 Papaya, lightly sweet, lovingly nestles huge, delicious, salty-sweet oysters topped with miso and aburi sauce, then delicately torched. I was, in hopes of keeping my reputation, swearing in hushed tones. 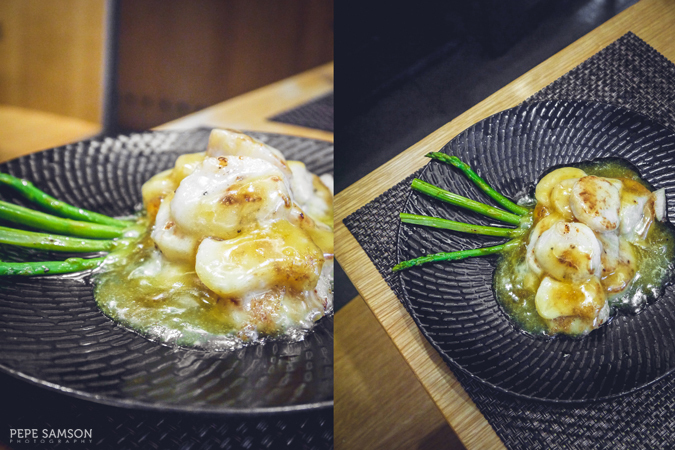 The US Scallops in Tamago Sauce (PhP720) doesn’t seem to tolerate human restraint though—a piece of the luscious, silky, pan-seared scallops smothered in a rich egg yolk sauce unleashed all cusswords I bottled up inside. Of course, other Japanese favorites are also available in the restaurant. 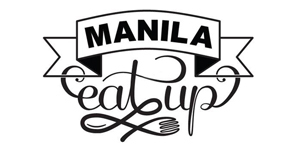 There’s teppanyaki, for instance, but Minami Saki’s uses tender Angus sirloin steak (PhP1,050) cooked medium to accompany the stir-fried vegetables. The meat here elevated an otherwise typical Japanese dish. 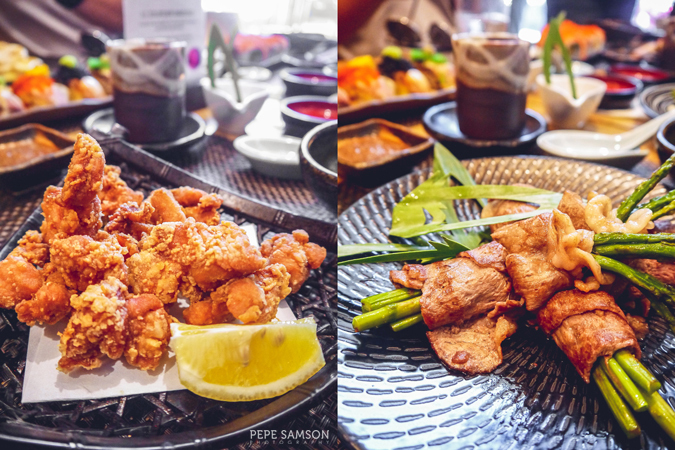 The Karaage is straightforward but well-executed; the chicken is still moist, the coating not too crunchy, just the way I like it. 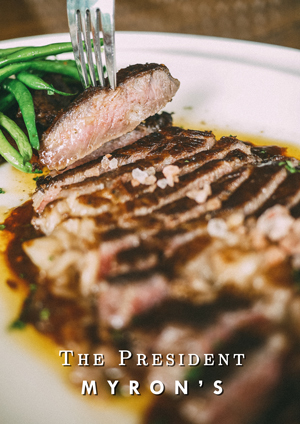 Beef lovers, on the other hand, will find themselves eating something healthy by force because the asparagus-stuffed beef is so good. 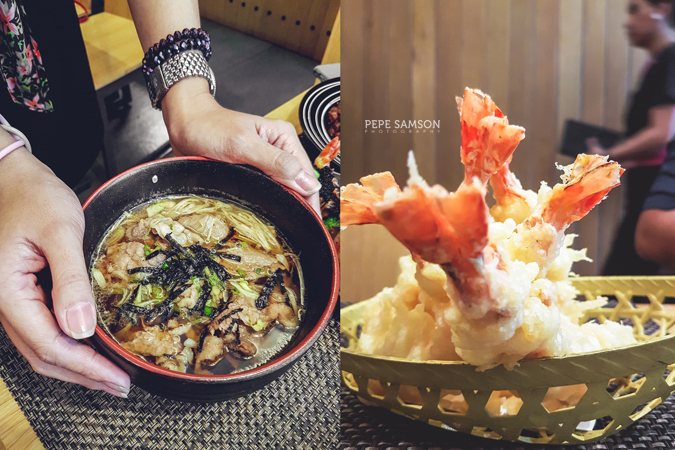 There’s also the Ebi Tempura (PhP595) present in all Japanese menus, as well as hearty noodle dishes (like the Gyuniku Udon below) that are perfect for the upcoming rainy days. 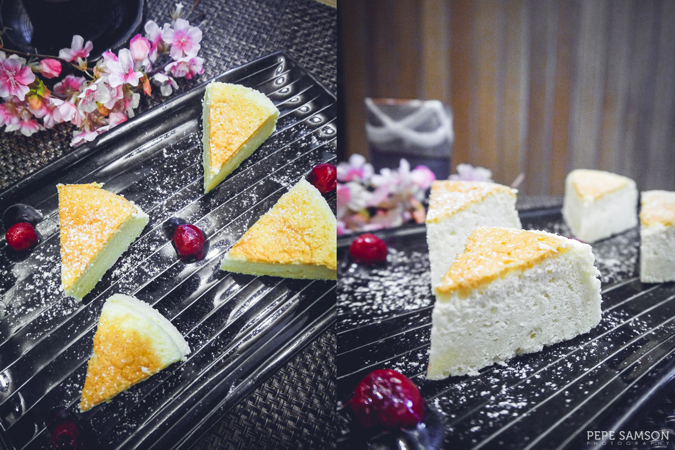 Desserts gained the same meticulousness as the savories—the Japanese Cheesecake (PhP160), light and fluffy, is a like dainty punctuation to a lively feast; the Wasabi Crème Brulee (PhP120), on the other hand, merges East and West with its French-inspired custard base and wasabi-infused caramelized sugar, giving the dish a distinctly Asian touch. This reduced me to tears. 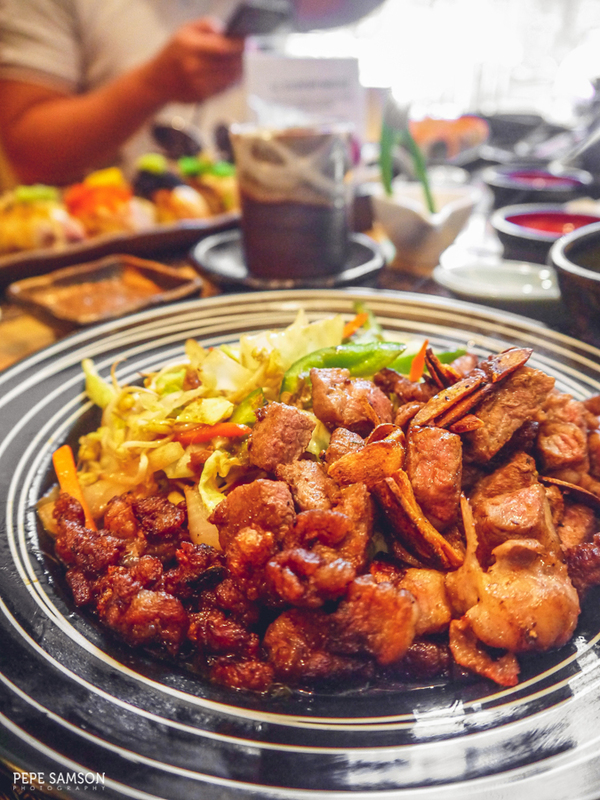 I’ve always been fascinated with the ins and outs of Japanese cuisine, and I’ve resigned myself to the thought that I could never understand the workings of the minds of Japanese chefs. Good thing I don’t have to comprehend—I could just sit back and happily appreciate this epicurean wonder. At Minami Saki, my fascination was increased tenfold. 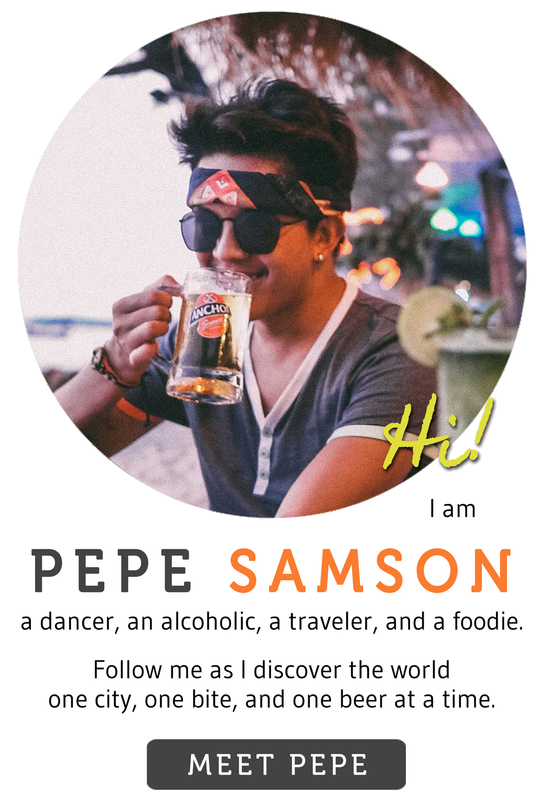 Indeed, a visit to this restaurant was like a weekend trip I couldn’t get off my head. I already bought a ticket back. 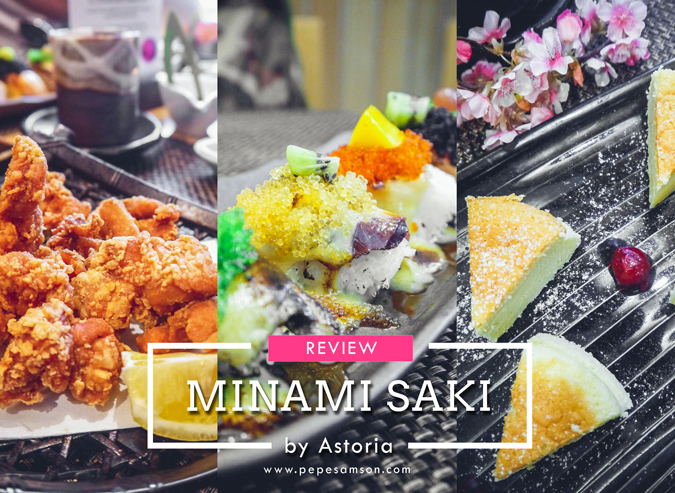 Have you dined at Minami Saki? What were your favorites? My meal was sponsored by Minami Saki by Astoria. All opinions, however, are my own.